Sid met Aya, a mysterious woman whom he met after asking to spend time with him as he battles insomnia and those long & empty nights. This movie is directed by Irene Emma Villamor under Viva Films. Casts: Dingdong Dantes, Anne Curtis, Gabby Eigenmann, Cholo Barreto, Bubbles Paraiso, Josef Elizalde, Pio Balbuena, Gab Lagman, Joey Marquez, Jobelle Salvador & Johnny Revilla. Sid and Aya is indeed not a love story. The movie is a life story. It teaches us to take risk for the persons we love. The movie is pragmatic and straightforward. It gives us a different kind of views in love and in life. It was raw and realistic. The status inequality was laid down well along with the contrast of characters between Sid & Aya. Sid being an established, well-mannered, handsome and arrogant person at the peak of his career. He is a go-getter and very determined in his goals. Aya, a hardworking middle-class woman who is cool, jologs and outgoing person. She is a family-oriented person. I salute how the Director played creatively the contrast of the 2 main characters and made it look seemless as both of them flaw effortlessly on the film’s promise of love and happy endings. Sid and Aya is not your typical sugar-coated love story. With the addition of scenes in the workplace (PH Stocks Market, Laundry & Coffee Shop), these location add to the complexity and differences of the two characters living their own lives and crossing their path somewhere in between. Cinematography is on-point. Color Grading was perfect. The Japan Scenes were beautiful and impressive. The Soundtrack was great too. Everything is so smooth and flawless. Anne and Dingdon were such a joy to watch and I must say, their first time together on screen was a huge success. They were the film’s gem aside from the unconventional plot material. There is something deep and relevant about the ending. Its a thought-provoking and inspiring to say the least. Overall, I highly recommend Sid and Aya to everyone. How I wish the movie’s running time was longer. I was craving for more Anne and Dingdong’s scenes. Meet me in St. Gallen is a story of Celeste and Jesse who have found each other during the trying times of their lives. They spent a memorable night together and became separated for how many years. Their second chance of meeting again became special until they met each other at St. Gallen years after. This movie is directed by Emma Villamor under Spring Films and Viva Films. Meet me in St. Gallen is a good addition to the quality conversational Pinoy films ever made since “That Thing Called Tadhana’. I really loved that Filipino Film-makers are now taking risks with this kind of genre which usually brings out a well-produced and creative cinematic masterpieces to date. Overall, I fell in love with the movie. What I like about the movie is that its simplicity in terms of story-telling technique and overall plot material is supported with superb cinematography, great dialogues and a story that is deep, raw and very heartfelt. First of all, the plot is pretty much understandable. Its a story of two strangers met at a very random moment and eventually shared a nigh they won’t remember. As a whole, it is a story of chance encounters, timing and missed opportunities. I really like how the Director laid out the sincerity of the plot with the timelines presented in the movie. I would also like to commend the film’s Cinematography and sound engineering. The whole movie was done with artistry especially on the camera angles and shadows. The best part was of course the shot at St. Gallen which is by far my most memorable scene in the film. The whole backdrop was majestic and impressive. Of course, I also loved the Soundtrack especially the one with Moira’s. Since its a conversational film, the film usually invests on dialogues which the film did not disappoint from beginning to end. I was literally driven into a whole new kind of emotions listening to the words that come out from Jesse and Celeste. They were speaking on behalf of their souls and experiences. It was heartfelt and moving. The lines are relatable and engaging to the whole audience. Without spoiling the ending, I think the whole sequences were just right to give way to the climax. Despite three separate timelines, the movie never failed to create connections from one scene to another. Moreover, I also commend Bella and Carlo for such a strong chemistry together. Carlo being a musician and an aspiring Doctor was just so ideal for me. Carlo still has the charisma and the quality of acting that is worth your cinema ticket. Bella on the other hand never fails to impress me with her portrayal of a troubled artist wanting to be free of her own world. Bella was both charming and convincing for her role. Both of them both delivered their best performances and their connection with each other is undeniably strong. Meet me in St. Gallen falls short in providing cohesive attachment for each scenes especially in the character developments of Jesse and Celeste. I think their was not much of the intensity given and invested on how the values and choices of the characters affected their confusing decision at each timelines they will meet again. Also, the climax will somehow let you question if what is the film trying to say to us? Well, it might be different with yours. Despite this forgivable flaw, you should go and see Meet Me in St. Gallen. Mr. & Mrs. Cruz is a heart warming film about two individuals learning to love after a heartbreak. They both share memories and wonderful experiences in the wonderful island of Palawan. This movie is written and directed by Sigrid Andrea Bernardo under Idea First Company & Viva Films. Sigrid Bernardo never disappoints with Viva’s latest offering – Mr. & Mrs. Cruz. I am really quite impressed with the turnout of the movie. JC and Ryza are such charming together on-screen. 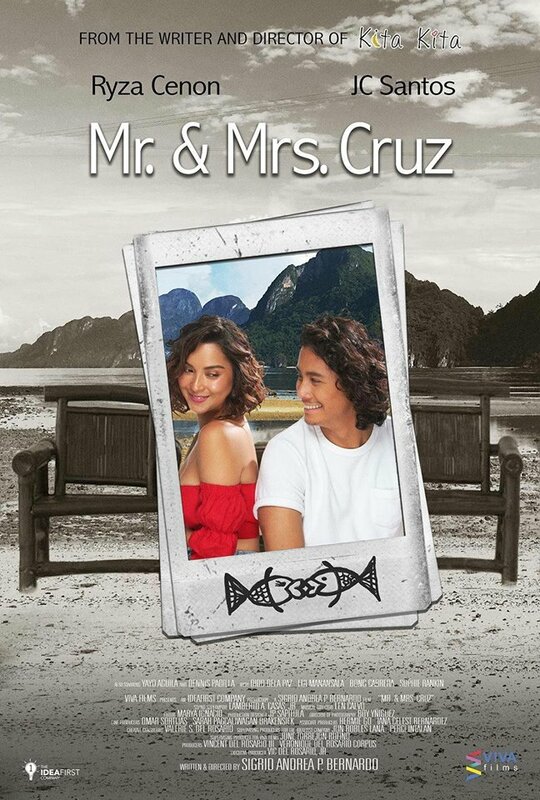 Mr. & Mrs. Cruz offers a realistic and relatable premise about heartbreaks and moving on. It invested on tourism with Palawan as the major backdrop. More than just the wonderful and amazing shots in the island, I was actually more compelled with the story and its soul. Palawan is given. The movie showcased the place with justice. Cinematography is spot on and color grading was the best for me. Drone shots are utilized well and did not overpower the continuity of the shots. The movie’s theme song and sound engineering was great too. I loved how the hugot music was utilized on some major scenes. Plot-wise, the movie won’t play around subplots. It is direct and sincere. Most of the scenes were like a mirror to all of us. The drunk scene at the bar was my favorite. It was raw for me. The pain is lingering within the movie. As the characters find the answers to their questions, Sigrid effectively created an atmosphere wherein all emotions are smoothly flowing within the characters and their choices of words. The tight shots and slowmos were creatively used and applied. The narration and metaphors were spot on. More than an impressive cinematic approach, there is too much happening in the movie that will truly glue your interest from beginning to end. I was smiling even after the film. Overall, the film geared towards a realistic ending. An ending that will make you crave more. JC and Ryza both gave award-winning performances. Finally, I am glad to see JC landing on a lead role. He was amazing in the film. His comedic timing and his charm really blended well with Ryza. He’s just too hot to handle at some point. Ryza was just amazing as usual. I am also happy that she landed on a lead role in a film like this. I was really impressed with her acting and her bubbly attitude in Mr. and Mrs. Cruz. What more I can say. The movie made me smile and it landed in one of my most fave Romantic films to date. Congrats Viva Films and Direk Sigrid!